"‹Once again some of the best known and well-loved Rugby Legends from the Wakefield area came back together again to celebrate the 14th Annual Legends Night, organised by the Rotary Club of Wakefield Chantry, in aid of their charities. Back Row l to r: Neil Fox, MBE, Trinity (Capt) & GB : Nick Fozzard, Castleford, St Helens and Warrington: Bob Haigh, Wakefield, Leeds & GB: John Kaye, Wakefield RUFC & Yorkshire RU: David Jeans, Wakefield RUFC, Leeds & GB : Geoff Oakes, Trinity & Warrington: Harold Poynton, Trinity (Capt) and GB: Ray Spencer, Trinity and Wakefield RUFC. Rotarian Ray Spencer, himself a player of some standing who played for both Wakefield Trinity and Wakefield RUFC, is the primary organiser of the event which took place this year at the St Pierre Hotel in Newmillerdam. Almost 100 people turned out to enjoy the night with Malcolm Lord, well known raconteur as Master of Ceremonies and Ray French MBE, as the guest speaker. Ray played both codes of Rugby at international level, was a 5 Nations Championship player in 1961 and was perhaps just as well known as the voice of the Challenge Cup on the BBC. Although having retired from full time commentating now, he is still active working at Radio Merseyside . 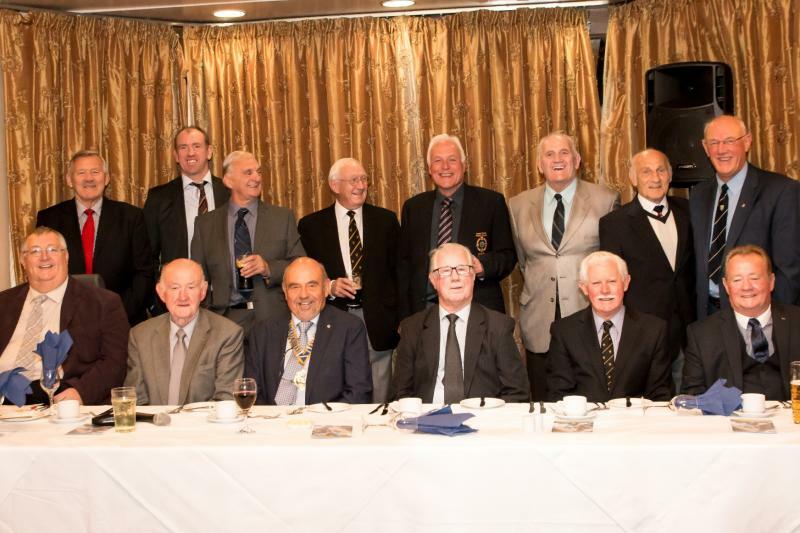 Bob Guard, President of the Rotary Club said “It was superb to see such an illustrious group of well-known sporting personalities coming together again in support of our Charities. We were honoured to have them as guests on such an entertaining night. This year those Charities are CAP in Wakefield, who provide a food kitchen in the centre of town and also help for needy families. KIDS in Wakefield, who support families with severely disabled children. One other Cause being supported on this night was the expansion project at Kingsland School which specialises in helping and supporting children with severe mental and physical handicaps. The night itself raised over £2500 in aid of the main Charities. Ray Spencer has calculated that over the 14 years that the event has been running, more than £40,000 has been raised for Charities and deserving causes, all in the Wakefield area. The Club and its members are looking forward to the 15th running of the event in 2016. In addition to helping raise money for the Rotary Charities, the evening also included the auction of a framed montage of Wakefield Trinity old programmes from the 1945 Yorkshire Cup Final with Hull, through to the 3 appearances in the 1960’s at the Challenge Cup Finals at Wembley (which they won 2 of!) and a drawing of the 1909 Northern Union final between Wakefield Trinity and Hull. The montage was donated by Duncan Beech and raised £250.